The sheer size of the British Empire brought about great changes and population shifts for many peoples and countries. With a pressing need to occupy, develop, and defend the newly acquired lands Great Britain became a nation which continuously sent a substantial percentage of its people to work elsewhere in the world, particularly to Canada, Australia, New Zealand, and South Africa. With the inclusion of immigration to the U.S., ShipsList estimates that, in the mid-19th century, over a million people were leaving the Britain every five years. Great Britain also organized the movement of millions of people from beyond the British Isles in order to meet the demand for labour and support services within the British Empire. Given that the British Empire constantly evolved over several centuries, and because there were political changes, several name changes occurred. To avoid confusion from this cause the term Great Britain, the British Isles and the British Empire have been used for consistency throughout this article, which is the first in a series on this topic. Despite the large number of people of all walks of life that were immigrating to all parts of the Empire it was impossible to meet the need in demand from Great Britain alone. In order to facilitate the supply of labour a Royal Commission to oversee Colonial Land and Emigration was established. This commission posted advertisements for the chartering of ships to take local people from the Indian subcontinent and China to the West Indies at a fixed rate per head. The scope of the commercial migrations was very substantial and complex. Today, the descendants of these imported workers remain as part of the social fabric of nations, examples being Fiji and Canada. While the formation of the British Empire brought great wealth to some of the citizens of the British Isles many individuals were living in extreme poverty. The numbers of such individuals escalated when the British army and navy were largely disbanded at the end of the Napoleonic Wars. Possibly as many as 500,000 men returned home to find there was little work for them. € is situation was then compounded by successive crop failures and increases in the price of food. Many influential individuals, organizations and governments saw considerable merit in promotion of schemes where ‘surplus’ poor would be encouraged to move to the far flung reaches of the Empire and thereby better themselves and simultaneously begin the building of the necessary infrastructure of the various lands then under British control. Many of these schemes involved municipalities or parishes who were responsible for the poor and the destitute. Two famines occurred in Ireland; both were caused by potato blight. The first, 1740–1741, was severe but the second, known as the Great Famine, lasted for a longer period: 1845–1852. It is estimated that a million people died from hunger and disease. Another million people emigrated, …. 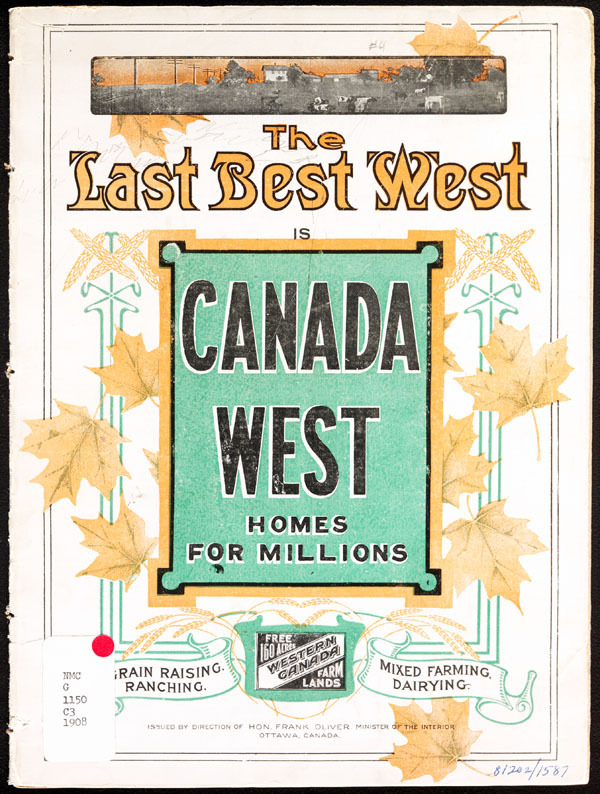 In 1896 and after, the Canadian government advertised throughout England using posters and hand bills luring English settlers to move and populate Western Canada. Learn more about immigrations push/pull effects: slavery, transportation of convicts, reformatories and more by reading Relatively Speaking, May 2011. Relatively Speaking, August 2005 issue sparkles with homesteading articles. Buy it!